As the launch of the iPhone 6 approaches, Apple continues to hold its title as the number one handset manufacturer among consumers in the United States, making significant gains in share during the three month period ending in July. According to ComScore's latest numbers, the iPhone had a 42.4 percent share of the market, up from 41.4 percent in April. Samsung also saw small gains, jumping to 28.4 percent from 27.7 percent in April. 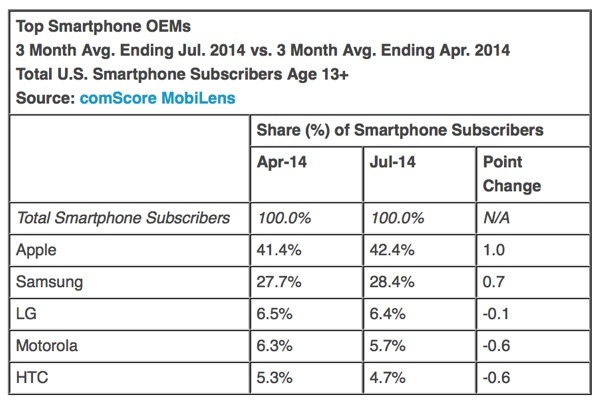 Meanwhile, LG, Motorola, and HTC lost share, a trend that's been ongoing for several months. While Apple is the top handset maker, iOS has always fallen behind Android when it comes to operating system share, due to the large number of Android-based phones on the market. Apple did make headway during the July period, however, as Android lost share, dropping to 51.5 percent from 52.5 percent during the April period. 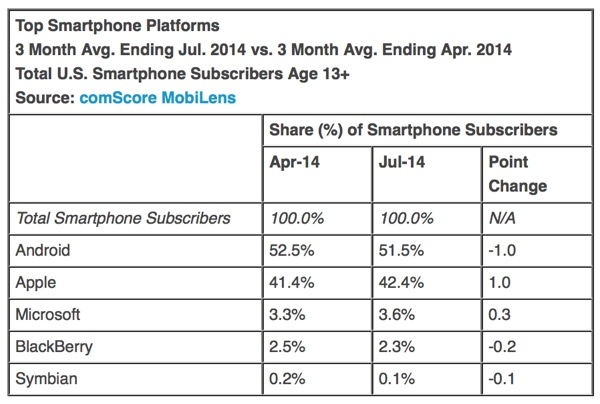 iOS, meanwhile, jumped from 41.4 percent share to 42.4 percent share. iOS is the only platform that continues to gain significant ground, with BlackBerry and Symbian losing share while Microsoft gained 0.3 percentage points. It will be interesting to watch ComScore's numbers in the coming months, as Apple may see gains in both handset and operating system share. The company is preparing to launch the iPhone 6, which will offer larger displays of 4.7 and 5.5-inches. Display size has been one of the major features differentiating the iPhone from larger Android phones, and the increase in size may encourage a number of Android users to switch to Apple's platform. Because ComScore's data tracks installed user base rather than new handset sales, it is more reflective of real-world usage but slower to respond to shifting market trends than some other studies. 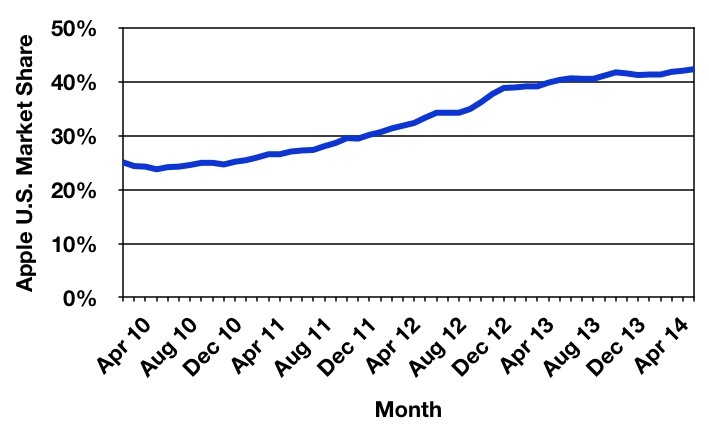 But I thought Apple was "doomed" and Tim Cook has no idea what he is doing? And I thought that market share didn't matter. Samsung up 0.7 = "little gain"
Apple up 1.0 = "significant gain"
I mean, I prefer Apple over Samsung, but....REALLY?! Its like the Apple Vs. Microsoft war all over again. Apple better step up its game. As long as it is lower than 50% it will always be the OS to get knocked off. The Macintosh was ALWAYS below 50%... well below actually. In 30 years... has the Mac ever had more than 10% market share at any given time? The Macintosh had far less market share than Windows PCs... much less than 50%. But I gotta ask... what's the result? The iPhone once hit a high of about 20% smartphone market share a few years ago... which is also far less than your 50% benchmark. Just like the PC market... other smartphone manufacturers sold more units collectively than Apple. I'm just trying to figure out what happens to a company or a platform when they don't have 50% market share. Because from what I see... Apple has never had a majority share in either the PC market or the smartphone market. Yet Apple's entries in both are vibrant and successful. Lol. If there are massive cuts in subsidies, android will be destroyed in China. But you already knew that. No, and I don't think anyone would agree with your prediction. The overwhelming majority (85%) of smartphones sold in China are Android. Moreover, most of them made locally and many are sold at prices that don't need subsidies. So no, it's beyond ridiculous to claim that a lack of subsidies would destroy Android in China. Quite the contrary. It's high priced phones that are going to get killed. E.g. the iPhone which sells for $100 now with subsidy, will jump to $800, according to Patently Apple. I would love to see you break down exactly why the analogy is bad. Sounds more like the truth hurts. Analogies are used for a reason. It helps people to use commonly understood things to bring clarity to things they might not otherwise fully understand. There is nothing inherently "bad" about any car analogy. Your lack of reasons that the analogy doesn't apply is more proof to your obvious ********ness as to why you have an issue with it. To begin, I never said car analogies are inherently bad. When appropriate, they're completely acceptable. I said, "It's a indisputable fact this forum is the worst with car analogies." It's undeniable to all but the most obtuse, we are horrible with car analogies. We being MR forum members, of which I am one as well. Also conflating what I said about car analogies and analogies in general is pretty bad form. Cars aren't subsidized like phones. ~$200 bucks and a contract can get just about any phone. Until you can buy an M3 and a Corolla for the same subsidized price, analogy is not analogous. Cross comparison disconnect. No one compares M3's and Corolla's and these reports don't compare iPhones to budget Androids. These reports present market data. A number is a number is a number. If an iPhone is sold, whether 5S, 5C, 5, or 4S, the number counts the same. Ditto with Android, Windows, Symbian, etc. Should no one else's number count simply because Apple chooses to sell in only one category? That's stupid. So please, no more car analogies.